A course designed by Rocky Roquemore to take advantage of the beautiful natural setting in a Nature Reserve with the blue sea as its southern boundary. A 475 meter par-5 hole sets the tone of the course taking the player down a gentle slope to the first of the several undulating green. The par-3 fifth hole is a challenging dogleg to the left with a lake to catch the short ball. 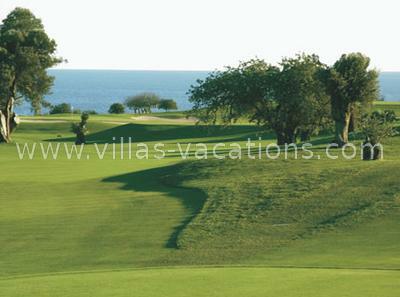 The back nine takes the player close to the beach and the panoramic sea views. The interesting par-4 fourteenth of 333 meters which is another dogleg to the left presents water to the right on the drive and then again inviting water to your left to carry on the approach shot to the green. The eighteenth par-5 of 475 meters has a generous width to the fairway but the green is almost surrounded by guarding bunkers.